Foxtrot - The Foxtrot remains the most popular social dance in the world today. The dance originated in 1913 when a vaudeville performer by the name of Harry Fox performed a little "trot" which appealed to the social dance teachers in New York and thus the Foxtrot was born. Little did Harry Fox realize that his trotting on a New York stage in 1913 would become an overnight success. The Foxtrot is the foundation for many of the social dances that followed. It is enjoyed by all age groups for its ease of movement and smooth style. Foxtrot music is played by most social dance orchestras and is one of the easiest dances to learn in the American Style. The International Foxtrot is one of the most deceiving dances as it looks very easy, but is one of the most difficult dances to do well. Foxtrot is part of both International and American Style Syllabii. Waltz - The romantic Slow Waltz is an offspring of the faster Viennese Waltz in 3/4 time. The rhythm was gradually slowed down over time as songwriters of ballads and love songs chose to compose in a slower and more comfortable tempo. This dance has continued to rise in popularity at anniversaries, graduations, and weddings. Waltz is part of both American and International Style syllabii. American Tango - The Tango is a progressive dance moving along the line of dance using body movement. A staccato movement of the feet and flexed knees highlight the dramatic style of the Tango. The Tango originated in the bordellos of Buenos Aires, Argentina and is done in a slightly different manner to the other dances. The hold is very different, with the lady's arm under the man's, which creates a tighter hold for a quick staccato action and stylized poses. (Not to be confused with Argentine Tango). Tango is part of both International and American Style Syllabii. American Tango adopted features of both Argentine and International or English Tango. It is the simplest of the tango styles. Hollywood gratefully adopted the style so that leading men would have some chance of looking good. Rudolph Valentino danced the American Tango in The Four Horsemen of the Apocalypse in 1921, and Arnold Schwartzenegger sort of did it in True Lies in 1994. Viennese Waltz - The Viennese Waltz is a fast waltz which originated in Austria. Joseph Lanner and Johann Strauss wrote the first waltzes of the early 19th century. The German, Paul Krebs, choreographed the Viennese Waltz style to which we dance today. 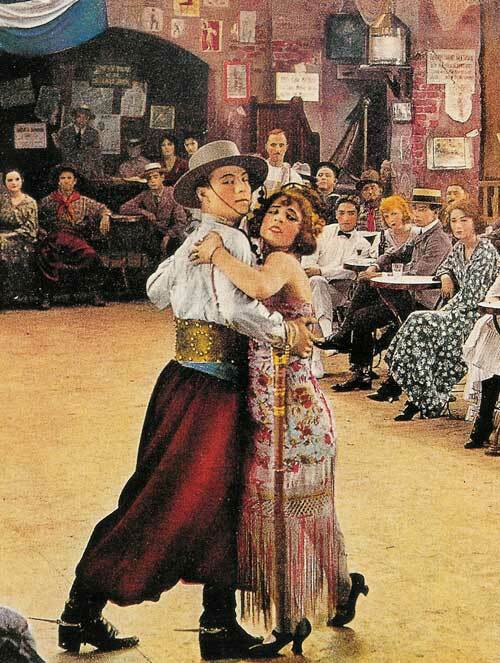 The music is fast in tempo and sends the couples whirling around the floor--first one way, then another.The dance enjoyed a great deal of popularity not only in Europe but also in America, and has been used in many Hollywood productions. The Viennese Waltz is part of both the International and American Style syllabii. Quick Step - As the name implies, the Quickstep is a very quick and lively dance, comprised of hops, skips, and kicks. The dance began as a quick version of Foxtrot mixed with the Charleston, and musical "Jazz" influences. Quickstep is part of the International Style syllabus. Rumba - The Rumba was originally a courtship, marriage and street dance that was African in origin. The Rumba met some opposition from society's upper crust because of the suggestive body and hip movements. The characteristic feature is to take each step without initially placing the weight on that step. Steps are made with a slightly bent knee which, when straightened, cause the hips to sway from side to side in what has come to be known as "Cuban Motion. "The Rumba is now considered a Cuban dance and is often referred to as the "dance of love." Sultry and romantic, the music is a mixture of African and Latin rhythms. This dance is included in both American and International Style dance syllabii. Cha Cha - An exciting syncopated latin dance, the Cha-Cha originated in the 1950's as a slowed-down Mambo. During the 1950's, the Cha Cha was made famous by many Latino bands such as Xavier Cugat and Prez Prado. Cuban in origin, the Cha Cha rhythm is found in the much of today's popular music.The Cha Cha gathers its personality, character, rhythm, basis and charm from two major dance sources. It is a derivation of the Mambo through its latin music, it is also a step-child of the Swing, as it is danced to its 1-2-3, step-step rhythm. The Cha Cha gets its name and character from its distinct repetitive foot rhythm. This dance is included in both American and International Style dance syllabii. East Coast Swing - This dance is frequently referred to as Triple Step Swing due to the rhythm of the basic triple step. This dance consists of six and eight count patterns, which require a rock step back by both lead and woman to begin. It is a circular dance that is danced with a bounce and is very grounded and not high in the legs. This bounce requires the dancer to stay very smooth and not jump around much. East Coast Swing is the base for all swing dances. The East Coast or American Swing is part of the American Style syllabus, and is considered the American version of the Jive. West Coast Swing - This dance consists of six and eight count patterns, which are done in a slot. The woman no longer rocks back as in East Coast Swing but instead she always walks forward on count one. This dance is usually done to medium tempo swing music, or music that is slower than typically used for East Coast Swing. "Mustang Sally" is an excellent example of a West Coast Swing. However, those who achieve a high skill level in this dance can and do dance it to faster tempo music. This dance has no bounce and has a very smooth feel to it. Rarely will you ever see high kicks or moves which require the dancer to leave the floor. Jive - The Jive is a very fast, acrobatic, and lively dance made popular during WWII by the swing music of Benny Goodman, Artie Shaw, Tommy Dorsey, and Glen Miller. It is the European version of the East Coast Swing. Six and eight count patterns make up this dance as in East Coast Swing; however, it is danced quite bouncy with very sharp foot kicks and "flicks". Unlike East Coast Swing, this is danced at a faster tempo swing music and is meant for competitive style dancing. The Jive is part of the International Style syllabus, and is the internaitonal version of the East Coast or American Swing. Samba - The Samba is a lively Brazilian dance and known to Brazilians as their native dance. The Samba was first introduced as a street dance in 1917 but Brazilian society finally adopted it as a ballroom dance in 1930. The style is to bounce steadily and smoothly in 2/4 meter. It is thought that the Samba was introduced in the United States in 1939 by the late Carmen Miranda. Unlike the other Latin dances that are stationary, it has a traveling action around the floor with lots of spins and controlled bounces. Samba is part of the International Style syllabus. Salsa - The word Salsa means sauce denoting a "hot" flavor and is best distinguished from other Latin music styles by defining it as the New York sound developed by Puerto Rican musicians in New York. The dance structure is largely associated with mambo type patterns and has a particular feeling that is associated mainly with the Clave and the Montuno. Hustle - The Hustle (Disco) is a member of the Swing family and is like the West Coast Swing in pattern. It has a distinct flavor utilizing flamboyant Disco-style music. Its great accomplishment was to bring partner-style dancing back into vogue among nightclub dancers in the 70's. Hustle is a fast, smooth dance, with the lady spinning almost constantly, while her partner draws her close and sends her away. Merengue - is a style of Dominican music and dance. Partners hold each other in a closed position. The leader holds the follower's waist with the leader's right hand, while holding the follower's right hand with the leader's left hand at the follower's eye level. Partners bend their knees slightly left and right, thus making the hips move left and right. The hips of the leader and follower move in the same direction throughout the song. Partners may walk sideways or circle each other, in small steps. They can switch to an open position and do separate turns without letting go each other's hands or releasing one hand. Mambo - The spicy Mambo as we know it now, grew out of the Danzon (national music of Cuba) and grasped the imagination of the American dance scene at the close of WWII. Later, the Swing-Jazz and upbeat Latin music joined to form the updated and uninhibited Mambo. The Mambo is a spot dance and the steps are quite compact. Mambo is part of the American Style syllabus. Bolero - Originally a Spanish dance in 3/4 time, the Bolero was modified in Cuba to become 2/4 time, then eventually into 4/4. It is now present as a very slow type of Rumba rhythm. The music is frequently arranged with Spanish vocals and a subtle percussion effect, usually implemented with Conga or Bongos. Bolero is part of the American Style syllabus. Paso Dobles - The Paso Doble is a theatrical Spanish dance that characterizes the man as the matador and the lady as his cape. Based on Flamenco dancing, the character of the dance is arrogant and passionate. Paso-Doble is part of the International Style syllabus. Carolina SHAG - a swing dance that originated in South Carolina in the 1940s and still is our state, Carolina shag is more closely associated with a variant of rhythm and blues known as "beach music". And, for this reason, many dancers no longer consider Carolina Shag to be a true swing dance. The term "Carolina Shag" is thought to have originated along the strands between Myrtle Beach, South Carolina, and Wilmington, North Carolina, during the 1940s. According to Bo Bryan, a noted Carolina Shag historian and resident of Beaufort County, the term was coined at Carolina Beach, North Carolina. Today, the shag is a recognized dance in national and international dance competitions held across the United States. The 1989 film Shag starring Bridget Fonda, Phoebe Cates, Annabeth Gish, and Page Hannah as four high school friends on their last road trip together before graduation, was filmed in Myrtle Beach and features the Carolina shag. In 1997, the country music band Alabama recorded the single called "Dancin', Shaggin' on the Boulevard" referencing this style of dance. Foxy (Slow Dance) - . The Art of Slow Dancing is where we take Ballroom Dances out of the Ballroom and put them in to the Bar Room! Slow Dance is learning how to adjust these patterns to different speeds of romantic music. There are moments when the ability to dance gracefully to romantic music is mighty important. Line Dances - A line dance is a choreographed dance with a repeated sequence of steps in which a group of people dance in one or more lines or rows without regard for the gender of the individuals, all facing the same direction, and executing the steps at the same time. Line dancers are not in physical contact with each other. Examples of Line Dances: Electric Slide, Cupid Shuffle, Cha Cha Slide, Tush Push, The Wobble, Samba Line Dance and thousands more. Country Two Step - The country/western two-step, often called the "Texas two-step" or simply the "two-step," is a country/western dance usually danced to country music. The two-step is a partner dance, consisting of a "leader" (traditionally a man) and a "follower" (traditionally a woman). The leader determines the movements and patterns of the pair as they move around the dance floor. It is a progressive dance that proceeds counterclockwise around the floor. Private Lesson Dance Instruction in our Greer or Simpsonville locations.